Mould grows when it has the proper habitat to grow in. The two things that mould needs to grow are moisture and a lack of light. So logically, to prevent mould we must take away one or both of the factors that support mould growth. Here are some of the best ways to prevent mould in your house. 1. Using dehumidifiers: If the humidity in your house or a room in your house is over 55% then it needs to be lowered because at these levels mould is able to thrive. Using a dehumidifier will bring these levels down. 2. Preventing water leaks: some of the ways that water can leak into your house is from your pipes, foundation, roof, windows and gutters. The best way to prevent these forms of water leaks is to simply check them and if you notice that they are bringing extra water into your home then get it fixed before mould grows. 3. Damp proof your basement/crawl space: This can be done by a professional service but there are things that you can do which are not overly expensive and will help with the dampness. You could put a plastic sheet in crawl spaces to stop some of the excess moisture coming up or you could simply make the space better ventilated, which will help with the dampness. 4. Avoid using mouldy materials: Every once and a while you build things in your home or just bring something indoors from outside. Check to see if there is any mould already growing on the materials before you bring it in so that it cannot spread in your home. 5. Keeping things clean: Mould is not able to grow if you just never give it a chance to grow. Dirt and dust are a perfect place for mould spores to hide. Make sure you remove them before they get a chance to bloom. 6. Properly vent appliances: Things like space heaters, ovens, stoves, furnaces, fireplaces, water heaters, and clothes dryers, are completely good to use as long as they are vented properly. Whenever these types of appliances are running they produce water which means more moisture. Venting the moisture outside is the best but it is also acceptable if there is enough air flow to get it away. 7. 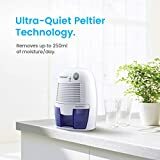 Using an air purifier: The point of an air purifier is to remove the spores out of the air that travel around and spread the mould. You will need an air purifier which is able to remove or kill the spores like a HEPA or ionizer type.